Fig. 9. Measurements in the His bundle electrogram for evaluation of atrioventricular conduction. AH interval, measured from the earliest reproducible rapid deflection of the atrial electrogram in the His recording to the onset of the His deflection, represents conduction time from the low right atrium at the interatrial septum through the atrioventricular node to the His bundle (atrioventricular node function). The HV interval, measured from the beginning of the His deflection to the earliest onset of ventricular activation (surface leads or intracardiac recordings), represents conduction time from the proximal His bundle to the ventricular myocardium (infra-His conduction function). III, surface electrocardiogram (ECG) lead III; V1, surface ECG lead V1; V5, surface ECG lead V5; A, the onset of atrial activation; H, the onset of His activation; His, His bundle; HRA, high right atrium; P, the onset of the P wave; RVA, right ventricular apex; V, the onset of ventricular activation. anesthesia. Multiple electrode catheters are placed at the key locations of the heart, such as the high right atrium close to the sinus node, the coronary sinus (for recording and stimulating the left atrium), the His bundle region, and the right ventricular apex. AH and HV intervals are routine baseline measurements of electrophysiological study (Fig. 9). A mapping and ablation catheter is also inserted when ablation is attempted. The ablation catheter usually has a varying deflectable distal segment (1.5-3 in) with a distal electrode of 2.2-mm diameter (7 French) and 4 mm long. 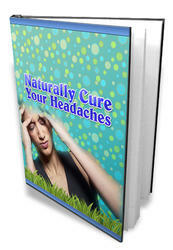 Physiological signals are usually digitized at 1000 Hz and filtered between 30 and 500 Hz. Pharmacological provocations, such as isoproterenol, are often required to facilitate induction of tachycardias. The purpose of ablation is to destroy myocardial tissue by delivering electrical energy over a distal electrode of a catheter placed on the endomyocardium integrally related to the initiation or maintenance of tachycardia. The first successful ablation using direct current shocks in a human was performed in 1982. Such shocks are now replaced by radiofrequency energy at the range of 100 kHz to 1.5 MHz. Lasers, cryothermy, and microwave energy sources have been investigated, and some of these methods continue to be of interest. Because the radiofrequency portion of the electromagnetic spectrum is conducted through cardiac tissue, it generates resistive heat in the tissue under the tip of the ablation catheter (with the reference patch usually placed on the skin of the patient's thigh). Temperature at the tip of an ablation catheter is controlled between 50 and 70°C to avoid coagulation of blood and desiccation of tissue, which occurs when the temperature reaches 100° C or greater. Irreversible cellular damage and tissue death occur once tissue temperature exceeds 50°C. Application of such radiofrequency energy, for 30-120 s, will normally result in a necrosis lesion with a radius of 45 mm and a depth of 2-3 mm. Irrigated-tip catheters can prevent excessive heating of the tip and allow greater power delivery, leading to larger and deeper ablation lesions as required. Diagnostic electrophysiological study and ablative procedures can normally be accomplished in a single session. Ablation of arrhythmias is usually indicated whenever feasible for the patient's preference or refractoriness of arrhythmias to drug therapy. New technologies such as intracardiac echocardiography, nonfluoroscopic electroanatomical mapping, and noncontact endocardial activation mapping have significantly contributed to advancements in interventional cardiac electro-physiology. The indications for ablation are summarized in Table 4. Polymorphic ventricular tachycardia and ventricular fibrillation are not indicated for ablation using current ablative techniques. Radiofrequency ablation is now a consistently effective treatment for typical atrial flutter in addition to atrioventricular nodal reentry tachycardia and atrioventricular reentry tachycardia. Atrioventricular junctional ablation plus pacemaker implantation is well accepted in controlling symptoms caused by refractory atrial fibrillation. • Atypical atrial flutter (type II)"
• Focal atrial fibrillation ablation"
• Ischemic ventricular tachycardia (monomorphic, unstable)"
"Ablation procedures are under investigation or with clinical indications that are undefined. Catheter-based radiofrequency ablative approaches, designed to create linear lesions or aimed at focal sources, are exciting new approaches for drug refractory atrial fibrillation patients (8,9). In experienced hands, radiofrequency catheter ablation is able to eliminate spontaneous episodes of ventricular tachycardia in up to two-thirds of patients after myocardial infarction (10). At present, catheter ablation of ventricular tachycardia is largely adjunctive to amiodarone and the implantable cardioverter-defibrillator. Complications of electrophysiological study and ablation procedures can be related to the catheterization (local vascular complications, vasovagal reactions, and perforation of the heart and vessels, leading to tamponade and internal bleeding); subclavian puncture (pneumothorax, hemothorax, sub-clavian artery injury, branchial nerve injury, and subclavian arteriovenous fistula); vascular complications (embolization, hypotension, myocardial infarction); and radiofrequency ablation (postablation pain, atrioventricular block, and prolonged radiation exposure). The risk of complications is heavily dependent on the experience and skill of the operator as well as the type of ablation procedure. Ablation procedures have been shown to be cost-effective in the management of drug-refractory paroxysmal supraventricu-lar tachycardias. The total charges for an outpatient ablation procedure are typically $10,000-12,000. For ablation of Wolff-Parkinson-White syndrome, the cost is $6,600-19,000 per quality-adjusted year of life gained. Ablation procedures on patients with drug-refractory inappropriate sinus tachycardia are frequently performed to eliminate the portions of the sinus nodes that generate the fast heart rates along the superior aspect of the crista terminalis. Because of the anatomical structure of the sinus node, multiple lesions over 3-4 cm along the crista terminalis are often required. Nonfluoroscopic electroanatomical cardiac mapping and intra-cardiac echocardiography are useful in identification of the earliest activation site and the crista terminalis, respectively. The procedural goal is to achieve approx 30% reduction or more in maximal heart rate during infusion of isoproterenol and atropine. Unfortunately, to date, less than half of such patients elicit sustained improvements of symptoms; many of these patients require an additional ablation session, and some may need complete sinus node ablation and the subsequent implantation of a pacemaker. Right atrial tachycardia, arising along the length of the crista terminalis from the sinus node to the coronary sinus and atrio-ventricular node (cristal tachycardia), accounts for 83% of all atrial tachycardias. Other sites of atrial tachycardia clustering include the pulmonary vein ostia, coronary sinus ostia, or mitral and tricuspid valve rings. Regardless, appropriate identification at the earliest onset of the P wave is critical for optimal treatment. The "dancing catheter" or "pas de deux," pace mapping, and "destructive mapping" can be used for such atrial tachycardia ablation studies. In mapping to the midseptum, particularly when the pre-systolic activity is not significantly early, signals that are not fractionated or multiple sites with similar activation times may suggest an origin of tachycardia in the left atrium, such as within the pulmonary vein ostia. Diagnosis of anteroseptal atrial tachycardia is difficult but possible and in some cases can be ablated without causing atrioventricular block. The average success rate of atrial tachycardia ablation is 91%, with a complication rate of 3% and recurrence rate of 9%. Complications include sinus node dysfunction, atrioventricu-lar block, and phrenic nerve damage. Endocardial mapping in patients with typical atrial flutter has confirmed that macroreentry can occur in the right atrium. Most of the time, typical atrial flutter rotates in a counterclockwise direction around the tricuspid annulus in the frontal plane, although clockwise rotations have also been observed. On 12-lead ECG, counterclockwise atrial flutter presents a stereotypical "sawtooth" pattern, an upright flutter wave in V1, and inverted flutter waves in the inferior leads and V6. In contrast, during clockwise rotation, flutter waves in V1 are inverted; those in the inferior leads and V6 are upright. The macroreentrant circuit passes through a critical isthmus bounded by the inferior aspect of the tricuspid annulus, ostium of the inferior vena cava, the coronary sinus ostium, and the eustachian ridge (cavotricuspid isthmus). During endocardial recording, a multielectrode catheter should be placed around the macroreentrant circuit adjacent to the tricuspid valve to evaluate rotation around the tricuspid annulus and through the isthmus. Linear lesions that transect this isthmus cure typical atrial flutter. Because some atrial flutter circuits may not travel through the isthmus, it is important to confirm that the isthmus is critical to the maintenance of the flutter circuit using pacing maneuvers to demonstrate any potential concealed entrainment. Nonfluoroscopic electroanatomic mapping systems have provided a more precise and effective way to verify the creation of a complete linear ablative lesion. In general, irrigated-tip catheters appear more effective than, and as safe as, conventional catheters for atrial flutter ablation procedures and may also be more useful when conventional 4-mm tipped catheters fail. Currently, the success rate of the ablation of typical atrial flutter is greater than 90%, with the recurrence rate less than 10%. Confirmation of bidirectional isthmus block significantly reduces recurrence rates (11). Ablation of class Ic atrial flutter (atrial flutter that develops during class Ic antiarrhyth-mic drug therapy for atrial fibrillation) has been reported as a novel ("hybrid") approach for treating drug-refractory atrial fibrillation (12). From an ablative viewpoint, the term atypical atrial flutter is sometimes used for any macroreentrant atrial tachycardia that does not utilize the cavotricuspid isthmus as a critical component of a tachycardia circuit. Atypical atrial flutter consists of a heterogeneous group of arrhythmias presenting with stable, flutter wavelike morphologies on 12-lead ECG. Techniques for ablation of atypical atrial flutters are evolving, and successful ablation of atypical flutters, with focused sites on the right atrial free wall and the left atrium, has been described. Macroreentrant atrial tachycardia occurs frequently following surgeries for repair of congenital heart disease. The presence of multiple anatomic barriers (surgical incisions, patches, conduits, cavae, the coronary sinus ostium, and the pulmonary venous ostia) as well as atrial tissue damage (hypoxemia, ischemia, surgical scars, and fibrosis) provides rich substrates for reentry. Partially successful Maze surgery and radiofre-quency ablative procedures for atrial fibrillation may also leave substrates for intraatrial reentrant tachycardias ("incisional reentry"). The location for subsequent successful ablation varies from patient to patient and can be identified by concealed entrain-ment. Thus, electroanatomical mapping is useful in identifying the reentrant circuit prior to catheter ablation of incisional reentrant tachycardias. Radiofrequency linear lesions transecting one or more protected isthmuses sustaining macro-reentry are associated with acute success rates of 71-93%. However, recurrence rates may be as high as 40-46%. Several catheter-based ablative techniques are currently available that regularly provide symptomatic improvement in patients with drug-refractory atrial fibrillation. Catheter ablation of the atrioventricular junction and insertion of a permanent pacemaker have been shown to be effective in achieving ventricular rate control in patients with drug-refractory atrial fibrillation and are superior to drug therapy for symptomatic relief in selected patients. This approach can also be used for rate control in patients with drug-refractory multifocal atrial tachycardia. Surgical treatment of atrial fibrillation is ultimately aimed at elimination of the arrhythmia, maintenance of sinus node function, preservation of atrioventricular conduction, and restoration of atrial contractility. Surgical approaches include the modified Cox Maze procedure and the left atrial isolation procedure. The reported overall success rates in eliminating atrial fibrillation are high (over 90%) with low mortality rates (23%). Catheter-based Maze procedures have also been introduced. The technical difficulties in achieving stable linear conduction blocks have been recently improved using new technology, such as intracardiac echocardiography and non-fluoroscopic electroanatomical cardiac mapping systems. In patients with paroxysmal atrial fibrillation, success rates with and without drug therapy at 11-month follow-up were approx 33 and 13% for linear ablations limited to the right atrium and 85 and 60% for biatrial approaches. Fig. 10. 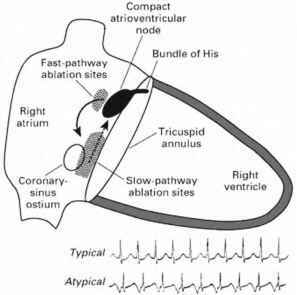 The slow-pathway (posterior) and fast-pathway (anterior) ablation sites for atrioventricular nodal reentry tachycardia. See text for discussion. Reprinted from ref. 14 with permission. © 1999 Massachusetts Medical Society. All rights reserved. followed by the right superior, left inferior, and right inferior pulmonary veins, respectively. 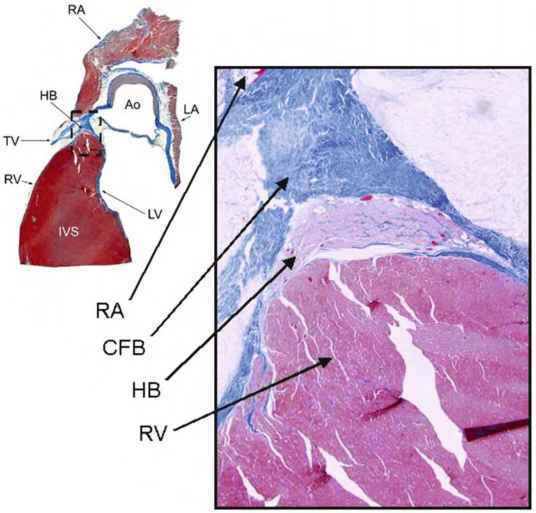 Electrical isolation of the pulmonary veins from the left atrium results in marked reduction or elimination of atrial fibrillation. This may be accomplished by sequential elimination of earliest breakthroughs at pulmonary venous ostia or by empirically encircling and isolating the ostia with radiofrequency or ultrasound. Saline-irrigated radiofrequency catheters may facilitate success by creating larger lesions; such ablations of focal atrial fibrillation may exceed 70%. Yet, multiple ablation sessions may be required to achieve this degree of drug-free arrhythmia control. It is considered that saline irrigation may reduce charring and perhaps reduce the thromboembolic risk of this procedure. However, long procedure time, high recurrence rates, thromboembolism, and concerns about pulmonary vein stenosis remain problematic. Dual pathways are defined as a sudden increase of at least 50 ms in the AH interval with a 10-ms decrease in the coupling interval of an atrial stimulus. A dual-pathway conduction curve can be demonstrated in a majority (85%) of patients with atrioventricular nodal reentry tachycardia. Yet, dual physiology may exist in 25% of patients without supraventricular tachycardias. Most atrioventricular nodal reentry tachycardia conducts antegradely through the slow pathway and conducts retro-gradely through the fast pathway (typical). In a small number of patients (4%), tachycardic circuits function in an opposite direction (atypical). Correction of atrioventricular nodal reentry tachycardia is aimed at ablation of the slow pathway in the posteroinferior area of the Koch's triangle between the coronary sinus ostia and tricuspid annulus (posterior approach) (Fig. 10) (12). The atrial/ ventricular signal ratio for slow pathway ablation, measured from a distal electrode pair in sinus rhythmn, is usually less than 1. Ablation of the fast pathway in the anterosuperior area of the Koch's triangle is now rarely performed because of increased risk of damaged normal atrioventricular conduction (anterior approach). 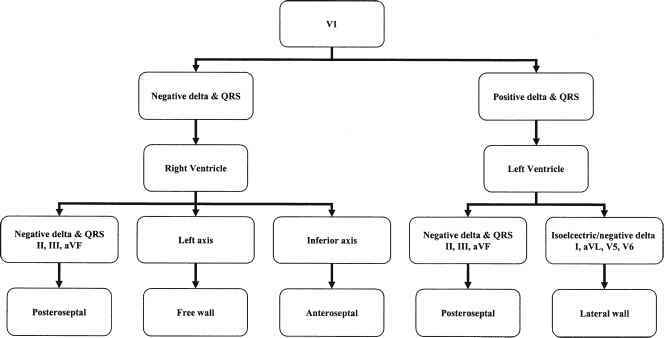 The risk of atrioventricular block is 1-2% with a posterior approach, relative to 5.1% with an anterior approach. Yet, in experienced hands, the success rate is almost 100%, with a recurrence rate of less than 3-5% and a risk of complete atrioventricular block less than 1%. An accelerated junctional rhythm is to be expected with successful ablation of slow-pathway conduction (100% in successful ablation vs 65% in unsuccessful ablation). In addition, putative slow-pathway potentials are often recorded during mapping. Furthermore, residual slow-pathway conduction or atrioventricu-lar nodal echo beats may be present after successful atrioven-tricular nodal reentry tachycardia ablation and are not necessarily associated with increased recurrence during follow-up. Most accessory pathways are "left sided." The approximate location of accessory pathways can be determined from surface ECG (Fig. 11) (13). A preablation electrophysiological study is initially performed to determine the precise location of accessory pathways. Yet, accessory pathways can exist at any sites around the tricuspid and mitral annulus: free wall (anterolateral, lateral, and posterolateral) and septum (anteroseptal, midseptal, and posteroseptal). Multiple accessory pathways have been reported in 5-18% of ablation cases. For treating left-sided accessory pathways, either a "retrograde transaortic approach" or a "transseptal approach" can be used in conjunction with anticoagulation using heparin (target activated clotting time 250-350 s). Ablation can be performed at atrial sites (during orthodromic atrioventricular reentry tachycardia or relatively fast ventricular pacing) or ventricular sites (during sinus rhythm or atrial pacing), targeting at the earliest atrial or ventricular activation, respectively. Accessory pathways often cross the left atrioventricular groove obliquely, with the atrial insertion closer to the coronary ostium. Mechanical mapping (inhibition of accessory conduction by mechanical pressure) and a QS wave analysis of unfiltered unipolar recordings may be helpful. The optimal ablation site can be found by direct recording of accessory pathway potentials in addition to stable fluoroscopic and electrical characteristics. The success rate of ablation for left free wall accessory pathways is 96%, with a recurrence rate of 3-8% and complication rate of less than 6% (major complications 1.3%: tamponade 1.2%, atrioventricular block 0.5%, systemic embolization 0.08%, and death 0.08%). Ablation of right-sided accessory pathways is associated with a lower success rate (88%) and higher recurrence rates (up to 21% in earlier studies). On the other hand, the annual risk of natural sudden cardiac death in Wolff-Parkinson-White syndrome with symptomatic tachycardia is estimated to be 0.05-0.5%. Fig. 11. Determination of the location of accessory pathways based on the delta wave and the QRS complex on surface 12-lead electrocardiogram (ECG). Reprinted from ref. 13 © 1997, with permission from Elsevier. There are two main substrates for ventricular tachycardia: focal and reentrant. Focal ventricular tachycardias are commonly seen in patients without underlying organic heart disease (idiopathic ventricular tachycardia). Idiopathic ventricular tachycardia accounts for 10-15% of all diagnosed sustained ventricular tachycardias. Approximately 70% of idiopathic ventricular tachycardias exhibit a left bundle branch block pattern, suggesting an origin in the right ventricle. These ventricular tachycardias almost uniformly show an inferior frontal plane axis, indicating an origin in the right ventricular outflow tract. Arrhythmogenic right ventricular dysplasia/cardiomyopathy should be suspected when other morphologies exist. The origin of idiopathic left ventricular tachycardia is usually at the inferior left ventricular midseptum or apex in the region of the posterior fascicle. Radiofrequency ablation of these tachycardias is curative in more than 90% of patients. Frequent isolated ventricular premature complexes or nonsus-tained ventricular tachycardias in clinically normal hearts can be ablated as well. Reentrant ventricular tachycardias usually occur in the presence of underlying organic heart disease, particularly in those with prior myocardial infarction. Ablation therapy is limited by their hemodynamic stability. Specifically, at present radiofre-quency ablation of ventricular tachycardias is predominantly limited to hemodynamically stable tachyarrhythmias. This only accounts for 5-10% of ischemic ventricular tachycardia (14) or 20% of all ventricular tachyarrhythmias requiring clinical assessment (15). Yet, it has been noted that catheter ablation of ventricular tachycardia after myocardial infarction may eliminate spontaneous episodes of ventricular tachycardia in up to two-thirds of patients in experienced centers (10). If one or two clinically documented ventricular tachycardias are targeted, successful ablation can be achieved in 71-76% of cases (16) with few serious complications (<2% of cases) (14). At present, catheter ablation of ventricular tachycardia in patients following myocardial infarction is used primarily as an adjunctive to amiodarone and implantable cardioverter-defibrillator therapy. More patients with ventricular tachycardia may be eligible for radiofrequency ablation as new technologies such as noncontact endocardial activation mapping and electroanatomical mapping become more common. Experience with ablations of ventricular tachycardia in patients with structural heart diseases other than ischemia is currently limited. In addition, entrainment is a very useful technique for assessing reentry tachycardia. Entrainment refers to continuous resetting of the reentry tachycardia circuit, by pacing at a slightly faster rate than the tachycardia and resuming the intrinsic rate of tachycardia when pacing is stopped. Each pacing stimulus creates a wavefront that travels in an antegrade direction and resets the tachycardia to the pacing rate. A wavefront propagating retrogradely in the opposite direction collides with the wavefront of the previous beat. An uncommon form of ventricular tachycardia that can also be corrected by radiofrequency ablation is bundle branch reentry tachycardia. The substrate for this form of reentry is usually a dilated cardiomyopathy associated with significant conduction system disease. Although cure of bundle branch reentry tachycardia can be easily accomplished by ablating the right bundle branch, long-term survival after radiofrequency ablation is limited by the almost uniform presence of severe left ventricular dysfunction.